National Insurance Company (NIC) was founded on 6th December 1906 at the height of the country's nationalist Swadeshi movement as an expression of the Indian aspiration to establish a strong original Indian company even in the midst of foreign rule. Today, 107 years after its integration, NIC stands tall as the oldest insurance company in India and the only PSU non life insurance company headquartered in the Eastern part of the country. As the Market Leader in two zones(North & East India) NIC has been recognized as 'Best in Service' in the motor and health classes of Business which constitute 63% of the Indian non life insurance market. NIC was the first mover in customizing general insurance products. CRISIL (A Standard and Poor's Company) has rated the company with AAA rating for its financial strength. Why Should You Choose National Car Insurance? As stated above, National insurance company was founded in 1906. It is the oldest general insurance company in India. It is the first one to introduce product customization and especially for the rural and corporate customer. With this new idea, it has gained a lot of visibility. It is also the first insurance company that entered into the alliance with automobile giant Maruti and two-wheeler major Hero MotoCorp, among many others. The company was also a great pioneer when it comes to the Bancassurance industry, partnering with some of the largest banks in India. Today, National Insurance is India's second-largest non-life insurance provider on the basis of its gross direct written premiums (GDWP). Motor insurance is one of the largest segment of the company. So, when you invest in insurance for a vehicle, it is always advisable to get it from a reliable player that carries a good track record. National Insurance has also been certified with exceptional ratings, signifying its strong capitalization, robust market presence, and consistent performance in investments. Well, when it comes to car insurance plan, it is always advisable to calculate the premium for the policy in advance. You can do the same bu using PolicyX.com car insurance calculator. With the same, you can easily have the idea about the amount that you will have to set aside as premium. It will also help you in setting the budget. Your details, the claim history, NCB earned age, profession, etc. Details related to the car, such as make and model, engine capacity, the area of registration, date of registration, etc. It offers an estimate of the premium in the form of a quote. If you are fine with the quote then you can proceed with the purchase of the policy. You can use the National car insurance premium calculator at its portal for identifying the premium for motor insurance. Buying the National Motor Insurance Plan online is easier than you think. Now it is quicker than ever. For buying the same, all you need to do is fill a form that will ask you for some basic details about the vehicle and its value. It may also include details about the safety devices that are installed, queries on parking and much more. By providing same basic details you will be able to buy the best plan for yourself easily. You can make payment through different forms that include Net banking, ATM /Debit card and much more. What do National Motor Insurance cover? Basically, you will get wider coverage under National Motor Insurance plans. With the wide range of products, the company tries to cater to every need of their customers. The features of basic motor insurance will be present in all National motor insurance plans. The helpful plans will assist you in keeping your vehicle secure from different types of unwanted situations such as theft, malicious acts, damages during transport by road, rail, etc. You must choose a plan that go well with your needs. You will also get several types of additional bonus on choosing any of the National motor insurance plans. The company offers a simple claim settlement service that will help a lot at the time of filing claim. If you check online, then you will come to know that the company is great in settling claims. It carries a good claim settlement ratio. The company settles claim in two different manners, one is reimbursement and the other is cashless which is highly popular as in the same you don't have to pay for any damage to the vehicle from your pocket, the insurance company will take care of that. In India, Motor insurance is a mandatory thing, you cannot drive on roads of India without a valid motor insurance as per the MOTOR INSURANCE ACT. You must at least have the third party liability coverage before you start driving. It provides the needful cover against legal liability to a third party in an accident. It is a package policy by National Insurance and offers wider covered as compared to the liability-only plan. It offers own-damage cover and third-party liability cover. It will protect the owner-driver of the insured vehicle from injuries/death. Wear and tear of the car that includes consequential loss, electrical and mechanical breakdown, breakages or other failures. Damage to the tyres of the car, unless the vehicle itself is damaged in the process. In this case, the liability of the insurance company is limited to 50% of the repair costs. Driving while intoxicated with alcohol or drugs. With the help of online web portal, you can easily renew the existing car insurance policy. At the time of renewal, you might be eligible to get a discount in the form of NCB if you can qualify. You have to log onto the online portal of the insurance company to start with the procedure. National Insurance Company Ltd. allows you to renew your car insurance plan easily. One can also renew car insurance policies issued by other insurance company. Policy renewals from other insurance company is eligible for a 10% discount. There will be two links on the page. One leads to the renewal of policies which is issued by National Insurance and other for insurance cover from other insurance companies. For the renewal, you have to simply fill the relevant details like policy number and email id to begin the process and follow the "on screen" instructions to complete the whole procedure. Keep your details ready with you, such as details of your bank account or credit card for online payment. The encrypted environment will safeguards bank and credit card details. You will receive an instant e policy in a printable format. A copy of the same will be sent to your email address. And you will get the hard copy of the same on the posted address. 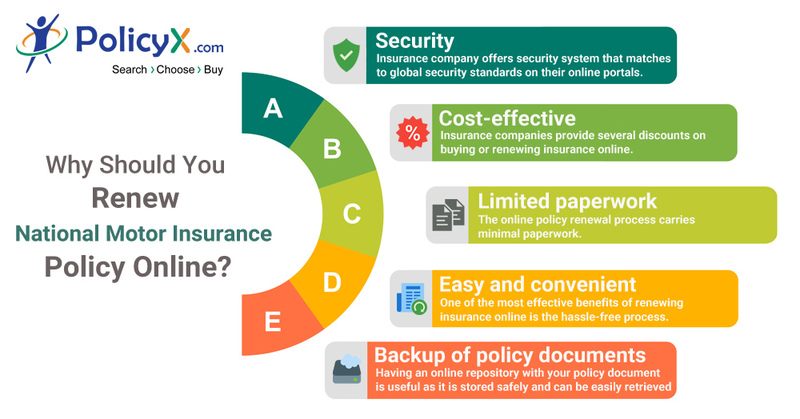 Why Should You Renew National Motor Insurance Policy Online? Security - Insurance company offers security system that matches to global security standards on their online portals. This makes sure that confidential information is not compromised. Cost-effective - Renewing car insurance online is really affordable because insurance companies provide several discounts on buying online. There are certain cost parameters that insurance company follows that includes the distribution and processing costs. The insurance company provides the cost savings to the customer in the form of discounts. Limited paperwork - The online policy renewal process carries minimal paperwork. Easy and convenient - One of the most effective benefits of renewing insurance online is the hassle-free process. Backup of policy documents - Having an online repository with your policy documentation is useful as it is stored safely and can be easily retrieved when needed. In case your insured vehicle is involved in a situation that qualifies for a claim then you can easily file the claim with the insurance company. In case of loss occurred, you must file a FIR. You must keep in mind that the FIR is mandatory for losses that occur because of fire, theft, burglary, accidents, damage to a third party, etc. It is not mandated for damages due to natural calamities, such as earthquakes, floods, inundation, etc. The insurance company will send a surveyor to assess the loss. The insurance company will eventually settle the claim. Please note insurer can ask for more documents in case of any doubt. 1. By renewing car insurance policy issued by other insurers, a person will be eligible for No Claim Bonus(NCB) earned by in the previous term? You can easily avail the NCB benefit by renewing car insurance with minimal information. Policy details are automatically retrieved to sync information and pass on the NCB rebate even though it was issued by a different insurer. 2. Why should I renew online when I can contact my agent or visit the nearest office of National Insurance? On buying online, you will get the advantage of documentation free renewal when done online. Plus, you can easily receive an e policy that can be printed for reference. National Insurance may offer periodic discounts for online payments. All these benefits work to your advantage. 3. I do not use my car too often. Do I really need to insure it? The Motor Vehicles Act made it compulsory for all vehicle owners to have at least third party liability cover. It is applicable for all vehicles, even the ones that are not used very often. 4. 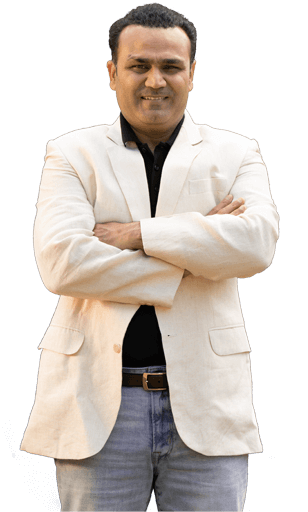 Is it possible to buy a National car insurance Personal Accident cover online? Yes, National Insurance Company Ltd. provides a Personal Accident cover for the owner - driver of the insured vehicle. It can be purchased through the insurance company's website instantly. You can also renew the cover through the insurer's website. I hold car insurance from past 2 years and till now no claim has been made. Happy with the car policy. I am not happy with the claim Process. Need to improve on claim Process. I have XUV 500 car insured with National Car Insurance, I am happy with the coverage value of this insurance policy. I pay a premium of Rs 15000 every year for this Car insurance policy.